WORDS: BIOG: Lodge, Thomas, M. D.
, a dramatic poet, descended from a family which had its residence in Lincolnshire; but whether the doctor himself was born there, seems not very easy to be ascertained. Langbaine and Jacob, and, after them, Wincop and Chetwood, who, in the general, are little more than copiers, say that he was educated at Cambridge, but Wood informs us, that it was at Oxford, where he made his first appearance about 1573, and was afterwards a scholar under the learned Dr. Hobye, of Trinitycollege. 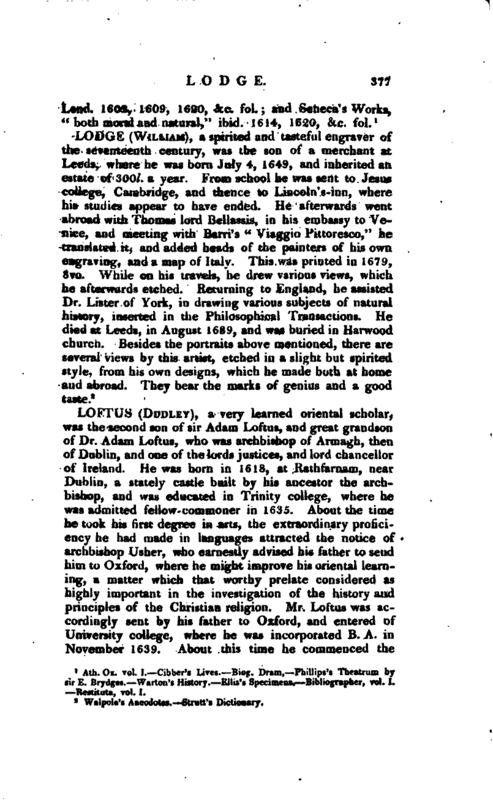 Here he made very considerable advances in learning, dedicating his leisure time to the reading the poets of antiquity; and, having himself a turn to poetry, especially of the satirical kind, he became known by | various compositions of that nature, which obtained him no 1 inconsiderable reputation as a wit and poet. 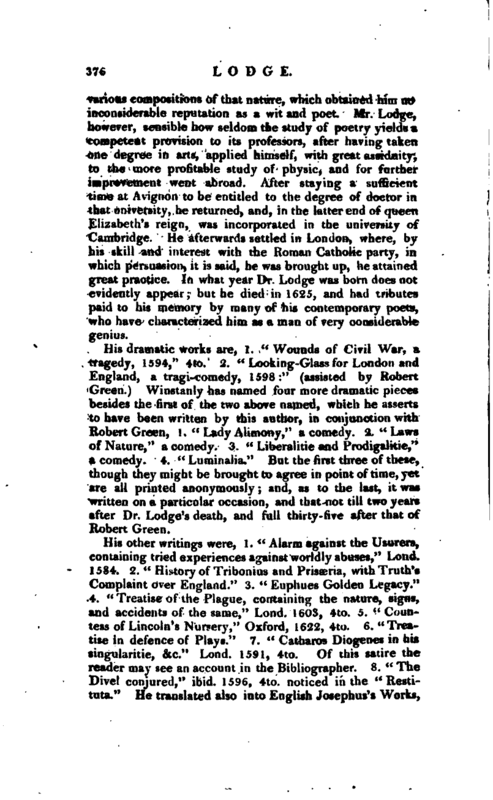 Mr. Lodge, however, sensible how seldom the study of poetry yields a competent provision to its professors, after having taken one degree in arts, applied himself, with great assiduity, to the more profitable study of physic, and for further improvement went abroad. After staying a sufficient time at Avignon to be entitled to the degree of doctor in that university, he returned, and, in the latter end of queen Elizabeth’s reign, was incorporated in the university of Cambridge. He afterwards settled in London, where, by his skill and interest with the Roman Catholic party, in which persuasion, it is said, he was brought up, he attained great practice. In what year Dr. Lodge was born does not evidently appear; but be died in 1625, and had tributes paid to his memory by many of his contemporary poets, who have characterized him as a man of very considerable genius. His dramatic works are, 1. “Wounds of Civil War, a tragedy, 1594,” 4to. 2. “Looking-Glass for London and England, a tragi-comedy, 1598:” (assisted by Robert Green.) Winstanly has named four more dramatic pieces besides the first of the two above named, which he asserts to have been written by this author, in conjunction with Robert Green, 1. “Lady Alimony,” a comedy. 2. “Laws of Nature,” a comedy. 3. “Liberalitie and Prodigalitie,” a comedy. 4. 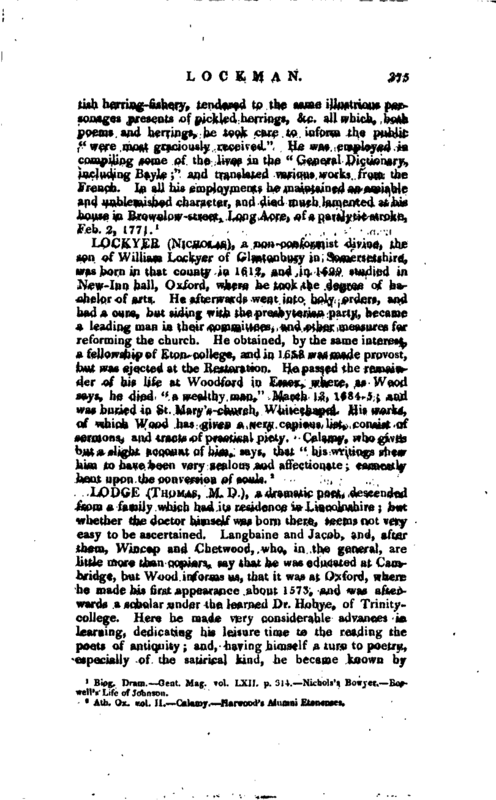 “Luminalia.” But the first three of these, though they might be brought to agree in point of time, yet are all printed anonymously; and, as to the last, it was written on a particular occasion, and that not till two years after Dr. Lodge’s death, and full thirty -five after that of Robert Green. Ath. Ox. vol. I. Gibber’s Lives. Biog. Dram, Phillips’s Theatrum by ir E. Brytlges. Warton’s History. Ellis’s Specimens. -Bibliographer, vol. I. Restituta, vol. I.